2017-18 monthly reports of Northern California rainfall. After a dry start to the season, 2017 was the second wettest November observed at Canebas station at: 4.36". That works out to 120% of a normal November. However, the preceding dry months resulted in only 86% of the rainfall normally received through the end of November. It is definitely too early in the season to guess what sort of a winter we might expect. Nonetheless, at the moment I'm observing more high pressure ridges than I would prefer during the time when we need the rain. Re: 2017-18 monthly reports of Northern California rainfall. Interesting report. In the western US we are heading into winter with lakes and reservoirs at the highest level they have been at in December for at least the past 5 years. Keeping our collective fingers crossed. Not surprisingly the cumulative numbers are also very grim. By the end of the month we will have only received 48% of a normal season's rainfall through the end of December. However thus far, California and other Western states are once more staring at drought straight in the face. Wish we could send some of our rain your way, even though we're ~10 inches below last years total. 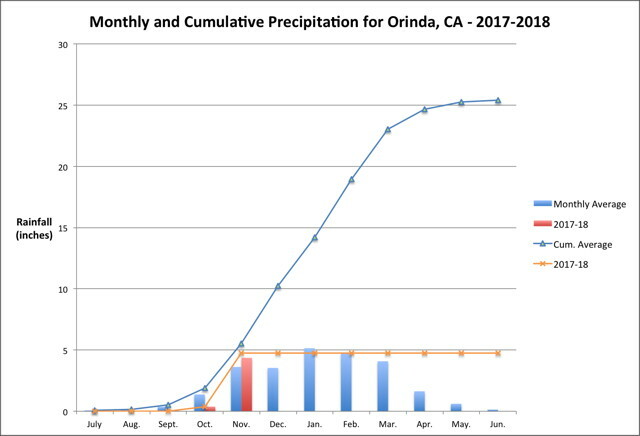 Unfortunately, I don't think the Winter rainfall has all that much to do with the Summer wildfires. The critical issue is how hot and dry the Summer becomes. This past year's Summer was very hot and dry and that definitely allowed the fires to grow quickly. Unfortunately the South is also suffering from a prolonged drought. "Total rain received at weather station is: 243.19"
Thanks for the confirmation. I'll probably work on a new (Station Totals) section of my Stats page. January also started out dry, but the second half of the month brought a change in the weather pattern with even one atmospheric river event that caused the horrible landslide in Santa Barbara. As a result, Canebas weather station got 87% of the normal rainfall for January. Alas, the string of preceding dry months left the cumulative total at only 66% of normal through the end of January. Worst still, February looks to be dry for at least the first half once more. So drought still looms . . . . Thanks for sharing. I have learned from observation that your storms turn into my storms a day later. You need to receive more storms so start working on that right away. Still that small amount of rain was sufficient to keep the cumulative rainfall above 1/2 at 54% of normal through the end of February. Alas, no matter what rainfall happens this Spring, it is clear we are heading back into another drought year. Most of the surrounding area where I live is in Severe Drought. My son just visited Cape Town, South Africa, on a business trip and reported that city is in serious danger of running our of water this year. What is heartbreaking is that there is nothing new in these situations. Even if there were no climate change occurring, tree-ring and other data has made it frightfully clear that as little as 1000 years ago there were droughts in the Americas which were far more extreme than anything modern humans have experienced. Extreme weather is the current explanation for the downfall of the Maya. It is also believed to have caused the fall of the old kingdom of Egypt and other civilizations in the region. The science is indisputable, modern societies have not made realistic preparations of the extremes of nature that are by our understanding completely normal - never mind what changes may be due to greenhouse gases. George Santayana is famous for saying: "Those who cannot remember the past are condemned to repeat it." However, our modern world has taken on it's own responsibilities for its preservation. Today we trust science to safeguard our future. We don't cast our fortune by seeking the favor of the gods (or God.) If we cannot muster the discipline and responsibility to act as science clearly demands that we must - what hope is there? That was enough to rain our cumulative total to the end of March to 71%. That is considerably better than the situation at the end of February. It appears we'll get at least some rain during the first part of April, so perhaps we will end up the season with sufficient rain to avoid renewed rationing. Sounds like you have given up hope that it will rain cats and dogs tomorrow and all will be well. 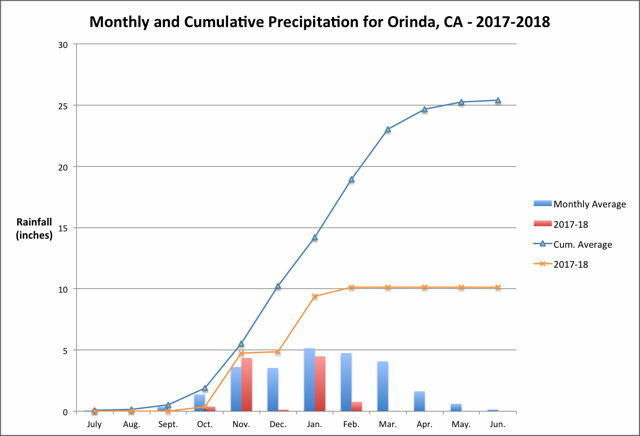 That was enough to rain our cumulative total to the end of April to 79%. That should be close enough to a normal season to avoid draconian water restrictions. Of course this late in the season this could be all the rain we'll see this year. In that scenario we would end up about 6" short of a nominal 25" of normal rainfall. That would be 76% of normal. That is probably still sufficient to avoid hard-core water restrictions. On the other hand, the creeks are drying up very fast. Our bird feeders are attracting creatures like raccoons that normally don't run out of water until at least June. For those things completely in the wild, it will be definitely a dry and hard summer. If previous years are any indication, it will also a relatively hot summer as well. According to the U.S. Drought Monitor, there are already very serious drought conditions in Utah, Arizona, Colorado, New Mexico, Kansas, Oklahoma, and Texas. Several years of below average precipitation is taking a grim toll in large portions of these states. Looks like California, Oregon, and Nevada are likely to be next on the list. If so, that's more than 25% of the lower 48 states land mass. Yikes.